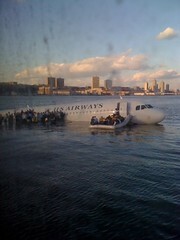 Recently, US Airways Flight 154 dropped out of the sky into the Hudson River after a bird strike killed both engines. Fortunately, due to correct responses on the part of Captain Sully and crew we had a “Miracle on the Hudson” instead of an urban plane wreck; the only mourning necessary was of the flock for the lost geese. And perhaps some mourning for traditional media. In the middle of the biggest concentrated population of journalists and media news writers, none of them ended up with up-close, on-the-scene coverage. Instead, it was ordinary folks like Janis Krums and others who provided the initial coverage of the event via free tools provided online including Twitter, Twitpic, Flickr, and FlightAware. Much fuss was made over the small operations of Twitpic succumbing to the flood of requests for the shot of the passengers standing on a wing of the plane, taken from a ferry heading to rescue them. More interesting to me was that Twitter didn’t crash, even as over 100 pages of content were generated by its users. The Internet isn’t New Media anymore: it’s Now Media. Individuals are now ready, enabled and aware enough that each can engage with their surroundings in ways never before possible—and they can provide that engagement in a distributed fashion, to their entire network. It used to be that some complained about how iPod-wearing train riders were dropping out of their surroundings; but the reverse is happening—instead, they’re able to engage large networks of people to their experiences. Many, many companies have been caught unprepared by this reversal of the media paradigm. Even after all of the highly specific coverage of US Airways 154 on Twitter, and the traditional media outlets playing up the story of Twitter’s role in covering the story, US Airways still doesn’t seem to have a Twitter account. Being absent from Twitter means that their online persona is going to be created by what is posted about them, and they’ll have no part of it. New media is the messenger, and the participants in it are defining your brand if you aren’t. Look below to see how US Airways is being defined today at Tweetag.com how would your brand fare? Title of the post is pretty much explanatory but I was not expecting that details out of it. To be very true, sometimes I feel very afraid or amazed when I see that power of “now Media” because it doesn’t take a long time to spread a story unofficially. As a former newspaper IT employee, I can tell you that traditional media needs to jettison hubris (its biggest product) before they can ever get turned around. I sincerely doubt this will happen. Nice post with good info although I’m surprised twitter didn’t crash. Eva, I do believe you are the new McLuhan! Good insights. This is why I am so afraid to fly. I know that this doesn’t happen everyday, but I don’t want to be on the plane when it does.